Earthfuture: Does your business wear a Green Climate Logo? Does your business wear a Green Climate Logo? It is the summer of 2010, and consumers across North America are on the lookout for a new green logo in shop windows and retailers’ catalogues. It’s a large 12 inch high circular sticker containing the words “Climate Change. YES - We’re Part of the Solution” – you can’t miss it, once you’ve seen it. To win the right to display the sticker, a business must demonstrate that it has measured its carbon footprint; developed a strategy to reduce it; engaged its staff; informed its customers; and made measurable progress towards its goal. The stickers include a small white circle that says “7%”, or “48%”, depending on the level of carbon reduction a business has achieved compared to its initial baseline. The race is on to reach 100%. Carbon offsets are not allowed – it must be a real reduction, including the transport used to ship goods. Is this fantasy, or a realistic insight into what’s coming? My personal hunch is that it’s only a matter of time before it’s a reality. In 2007, a business-supported initiative called Climate Counts launched a sophisticated scorecard that ranks 56 of the world’s top corporations for their contribution to climate change solutions, indicating whether they are Stuck, Starting, or Striding. In the first year, Burger King and Wendy’s scored “Stuck”, with zero points out of 100. Amazon and CBS also scored absolute zeros. Levi Strauss managed just 1, while the best that Apple and eBay could muster was 2. Canon came top with 77, followed by Nike on 73, Unilever 71, and IBM 70. As well as actual carbon reduction, the scoring includes points for whether the companies have supported progressive climate legislation. In the 2008 Scorecard, Burger King still scored 0, along with Wendy’s and the Jones Apparel Group (Anna Klein, Nine West, and many other brands). Amazon and eBay improved to 5, Apple to 11, CBS to 15, and Levi Strauss to 22. At the top end, Nike moved into the lead with a score of 82, followed by Stonyfield Farm 78, IBM 77, and Canon 74. 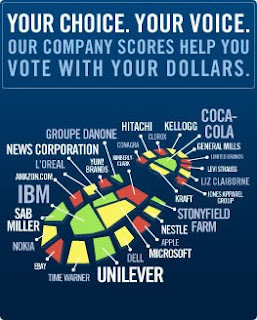 Overall, the corporations’ scores improved by an average of 22%, which speaks either to a deep commitment to change, or to the power of public shaming and reward, available for the whole world to see at www.climatecounts.org. This begs the question - do consumers care whether a business is taking action on climate change, or are they just looking for a bargain? In May, Havas Media asked this very question in a global market study with 11,000 participants in nine countries around the world. They found that 79% of those surveyed would rather spend their money with companies and brands that are working to reduce their environmental impact, and 89% would actively seek to do just this in the year ahead. Over 80% of the respondents said that they would buy more green goods if they were on offer, and 35% said they would be willing to pay more for them. The big surprise in the survey, apart from the high level of consumer desire to see action, was that consumers in Brazil, Mexico, India and China were more alarmed by climate change, and more willing to pay more for climate-friendly products than consumers in the USA, Britain, and Germany. (Canada was not included in the survey). For any company with aspirations towards global trade, this should serve as a wake-up call. The other surprise (or maybe not) was that only 11% of those surveyed thought their governments were doing enough to tackle climate change. The flipside of this is a strong desire for business to step up to the plate and show that it is taking the lead. Most companies are still asleep at the switch, however. In Britain, in 2006, a survey by The Carbon Trust found that 74% of people thought businesses were not doing enough to cut their carbon emissions and tackle climate change. What kind of initiative are companies taking? In Vancouver, the courier company Novex has changed 30% of its fleet to ultra-low emission vehicles, and is aiming to reach 100% by 2012. Small Potatoes Urban Delivery, Vancouver and Calgary’s organic food home delivery company, is sourcing over 50% of its products locally, and delivering by bicycle where possible. Since each delivery van carrying 100 orders saves 200 car trips, it is reducing overall fuel use by 40%. In Britain, the telecoms giant BT has set a goal to reduce its carbon emissions by 80% by 2016 – and has already achieved a 60% reduction. When they launched their company-wide initiative, their staff formed 28 carbon-busting clubs within three weeks. The British retail giant M&S has pledged to reduce its CO2 emissions by 80%, to double its regional food sourcing, and is running Carbon Challenge for its customers with the Women’s Institute. Nike found a way to remove SF6 – a powerful greenhouse gas – from the process it uses to fill the air pockets in its running shoes. Hyperion, a business management software company, is paying a $5,000 a year bonus to employees who drive a car that averages 45 mpg or more. Smaller companies can contribute just as much as larger ones. In Philadelphia, where the owner of the AOK Auto Body Shop changed light bulbs, installed motion sensors, put timers on equipment, switched to Energy Star appliances, and trained his staff to turn the lights off, he is reducing his emissions while saving $5,577 a year on a $7,832 investment. The days of voluntary action may soon be over. In Britain, starting in 2010, all quoted companies will be obliged to disclose their carbon emissions in their annual reports, and their performances will be compared in an annual league table summarizing the best and worst performers. It is only a matter of time before this becomes normal practice – and before those bright green stickers begin appearing in shop windows. Guy Dauncey is President of the BC Sustainable Energy Association, and author of the award-winning book Stormy Weather: 101 Solutions to Global Climate Change. He lives in Victoria. Posted by Guy Dauncey at 5:42 p.m.